The other week Meg and I had an outlet shopping date on a stormy Saturday. 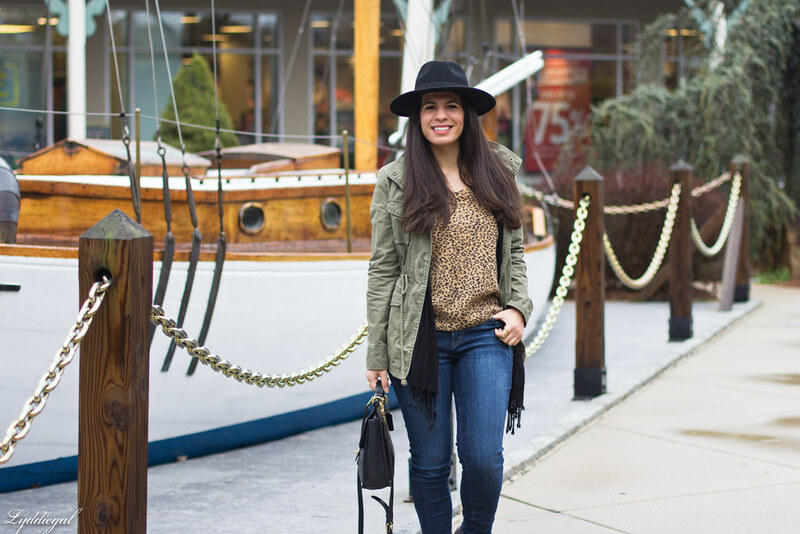 Thankfully the rain held off long enough to snap some outfit photos and while the Tanger Outlets in Westbrook is an outdoor mall, we managed to avoid the downpours and on the plus side, it was unseasonably warm. We'd both won gift cards to shop at Tanger through their instagram contest, so of course when you have money to spend, you never find anything you want. I did end up getting a tart pan I'd been wanting at Williams-Sonoma, and Meg found a sweater she liked on the clearance rack at J.Crew, but it was hardly the shopping extravaganza we'd been hoping for. We'll just have to plan another trip for when spring lines are in full swing. I always find it really disappointing when I'm hoping for a great shopping trip and then it falls flat - at least you have a pretty good guarantee of having more success next time! Haha that always happens to me! Whenever I have money to spend, I can NEVER find anything to buy. I always find stuff when I shouldn't be buying haha. 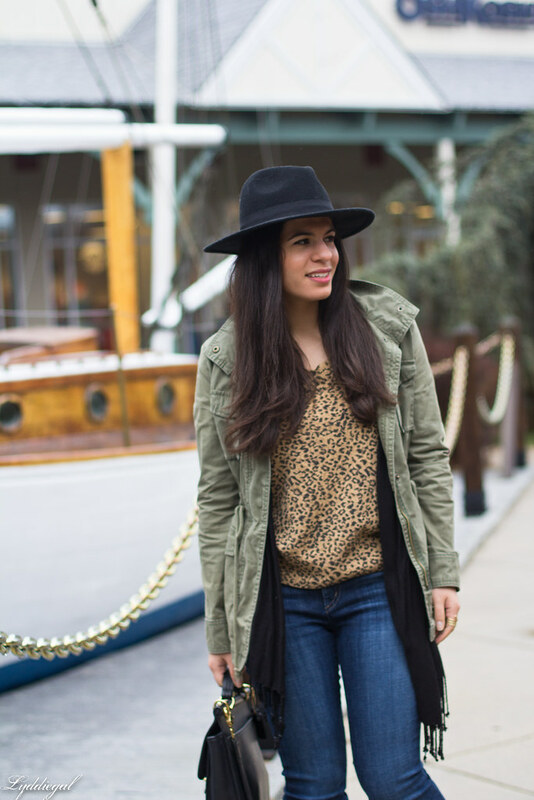 I love this leopard top paired with the olive green coat. Love the Tanger outlets! 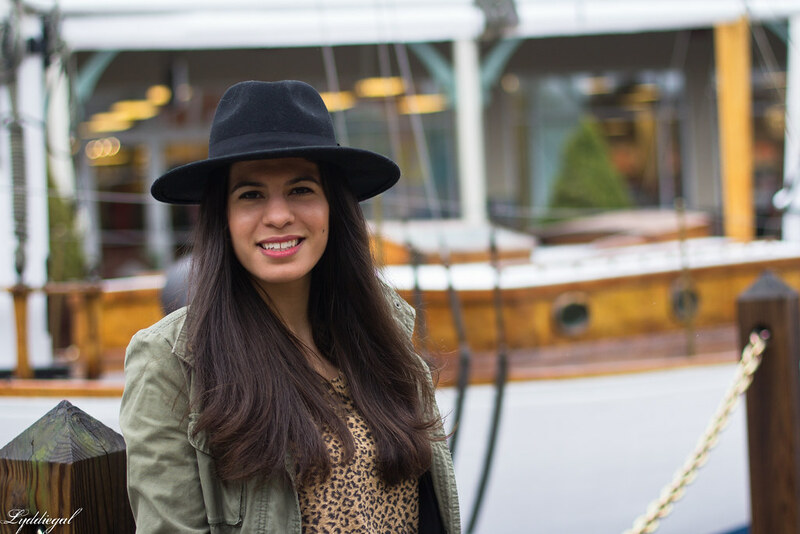 Great hat, perfect for a rainy day. Loving the layers and those booties!! That's so true, whenever I have gift cards or money to spend i can never find anything I want to buy. Love your bag!! I think it's gorgerous!! 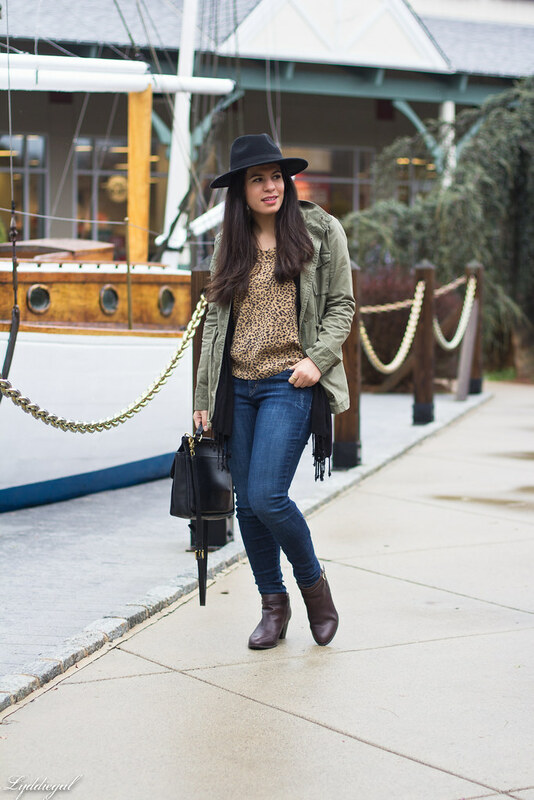 love the leopard print mix with the military jacket, what a great combo! When it comes to shopping I'm very picky, especially lately. So I can imagine how you felt, when your expectation didn't come true. I hope next time luck will be on your side. Rainy days in Ireland aren't unusual and so many time the photoshoot haven't been done just because of rain. That's wonderful that you had a chance for photos, because this shopping day look is wonderful, love how relaxed and yet put together it is. Isn't that always the case?! You have money to spend and nothing catches your eye to spend it on! Better to wait and find something fabulous then to settle though! That always happens to me too. Love your fab outfit! That always happens ! The day I have extra cash to spare I find NOTHING. The day I am broke, my credit card is maxxed and I have 3 bucks in my wallet: THAT is the day that everything fits like a glove and there is plenty to chose from. I never win instagram contests! :( Lucky you! Love your casual outfit. 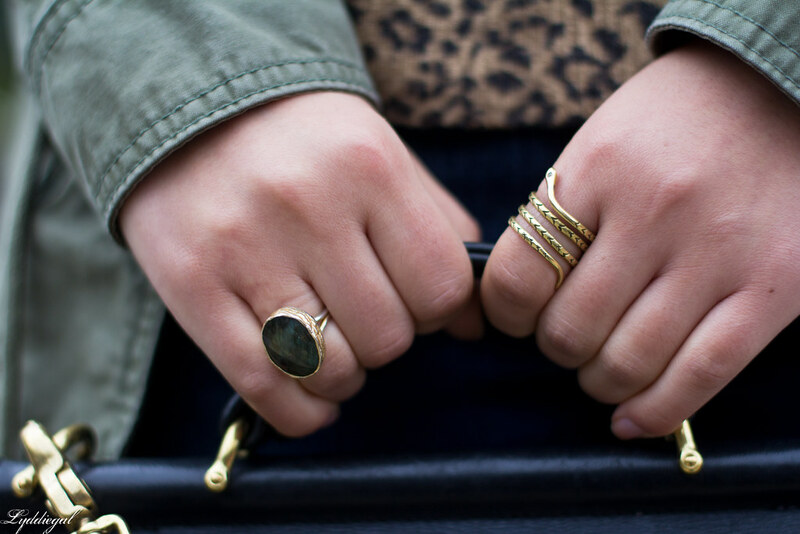 Loving the olive jacket paired with animal print! Such a cute safari inspired look; my faves! You look stunning in that hat! Isn't that always the case? Whenever I have money to spend that's always when I can't find anything, and when I'm trying not to shop everything I want goes on sale! :) Love this look and those gorgeous booties! A tart pan is still useful right? I hope you find some great deals in a few months then! Is that a boat? At an outlet mall? What an interesting fixture.